Business week in Tyndall College was a huge success with the theme being ‘Leaders’ and encouraging all students to ‘Get into Business’. The week started off with a fantastic display of research carried out by second year and LCA Students on Entrepreneurs in Ireland and abroad. 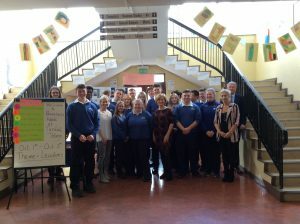 An Itinerary of events was organised for students from guess the inspirational quote, table quizzes, introductory session of skills @ work programme in conjunction with Carlow County Council , ‘The Founder Movie’ and questions workshop, visit to the library, name changes to all first year classes to Leaders/Entrepreneurs in which they had to research and present and games with guessing logos displayed around the school for student to try and solve. One of the highlights was guest speaker Brian Seery from Seery’s Bakery who spoke about his role as Sales Director and about how he has developed the business to date. Students were very interested and asked lots of questions and showed tremendous interest in the business. 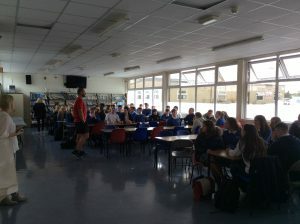 Another fantastic Motivational speech was to the 5th Years was Mr. Paul Ward owner/entrepreneur of Paulie’s Bootcamp in Carlow town. He gave a very motivating and encouraging speech to students on the secret to his phenomenal success in Carlow and how it’s important to believe in yourself, work hard to achieve your goals and never give up. Students were captivated by his speech and we hope that Business Week has encouraged students to think big, don’t give up, believe in oneself and abilities and will hopefully produce some young Entrepreneurs of the future!! !